A calcium-silicate-hydrate (aka cement) tip hovers above a smooth tobermorite surface in a computer simulation by Rice University scientists. The researchers studied how atomic-level forces in particulate systems interact when friction is applied. Their calculations show such materials can be improved for specific applications by controlling the materials’ chemical binding properties. Using sophisticated calculations that show how atomic-level forces affect the mechanical properties of a complex particle-based material, researchers from Rice University reveal new ways to improve the chemistry of materials like concrete to make it less prone to cracking and more suitable for specific applications. Even when building big, every atom matters, according to new research on particle-based materials at Rice University. The research appears in the American Chemical Society journal Applied Materials and Interfaces. 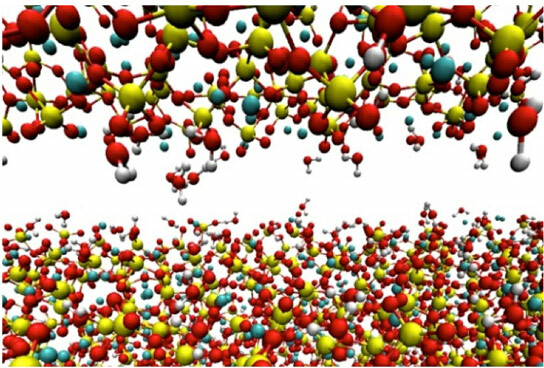 This video by the Rice University lab of materials scientist Rouzbeh Shahsavari shows, through simulation, how atoms in a smooth substrate are displaced by the force of a calcium-silicate-hydrate tip. The researchers’ calculations help predict the fracture toughness of materials and show how they might be improved by fine-tuning chemical bonding. Jalilvand is a former graduate student in Shahsavari’s group at Rice and is now a Ph.D. student at University College Dublin. Shahsavari is an assistant professor of civil and environmental engineering and of materials science and nanoengineering and a member of the Richard E. Smalley Institute for Nanoscale Science and Technology at Rice. The National Science Foundation (NSF) supported the research. Supercomputer resources were provided by the National Institutes of Health and an IBM Shared University Research Award in partnership with CISCO, Qlogic and Adaptive Computing, and the NSF-funded Data Analysis and Visualization Cyber Infrastructure administered by Rice’s Ken Kennedy Institute for Information Technology. Be the first to comment on "Fine-Tuning the Chemistry of Materials"